Some desserts are meant to be baked, fried, and unapologetically enjoyed while others are meant to be simple yet just as delicious! A few weeks ago, I had Vegan friends come over for dinner. Now if you’re friend of my YouTube Channel– Made to Order and my blog, then you know that I am far from Vegan! In fact, I was so worried about preparing this dinner party that in true Zee fashion, I avoided thinking and planning a menu for the event. Fast forward to the day of the dinner, and I finally wrapped my head around what I was going to make. Dinner include cauliflower steaks, samosas, mango chutney, and best of all: Banana Sushi. Now before you get bent out of shape– No I did not feed vegans fish with bananas! That would defeat the purpose of a vegan dinner. Instead, I crafted a dessert that involved no baking and consisted of easy to find ingredients. I created a dessert with bananas, peanut butter, chocolate, and coconut cashews– which are my new favorite. This sweet treat takes no time to make although it can be rather messy if you’re not strategic. 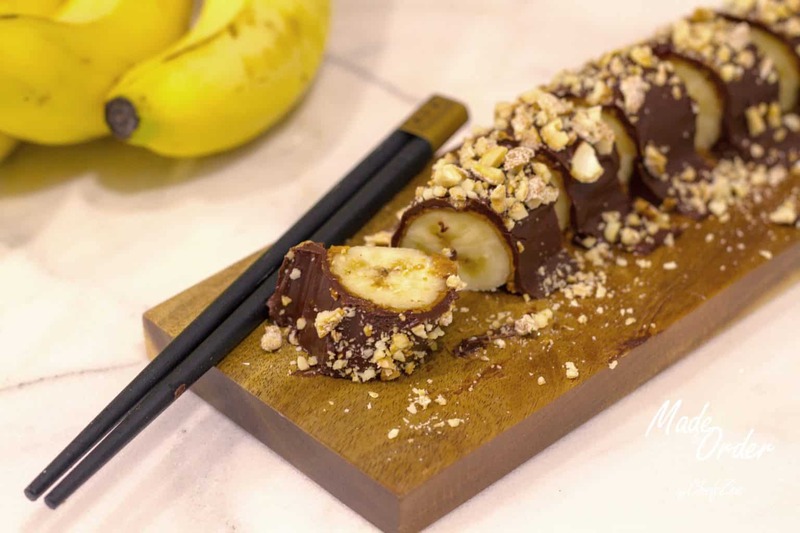 It’s also a fun dessert to make with kids and is the perfect after school snack. With that being said, this is a dessert that will delight vegans and non-vegans. It’s the ultimate crowd pleaser. You can also cover the bananas with shredded coconut for an awesome surprise as well.